FOR SALE BY CONDITIONAL ONLINE AUCTION In partnership with SDL Auctions Full terms and conditions are available at www.sdlauctions.co.uk/online-auctions With an abundance of opportunities for a variety of buyers and situated in approximately .43 of an acre, this four bedroom stone build detached period home situated in the Cheshire Countryside needs renovation throughout but has the potential to be a fantastic home for a variety of buyers. Offering spacious internal accommodation of approximately 1,719 square feet this home needs to be viewed to be fully appreciated. With an abundance of opportunities for a variety of buyers and situated in approximately .43 of an acre, this four bedroom stone build detached period home situated in the Cheshire Countryside needs renovation throughout but has the potential to be a fantastic home for a variety of buyers. Offering spacious internal accommodation of approximately 1,719 square feet this home needs to be viewed to be fully appreciated. From our office in the centre of Tarporley proceed out of the village towards Chester. At the roundabout take the third exit onto the A49 Warrington. Proceed up the dual carriageway and continue until you reach a set of traffic lights. At the traffic lights turn left onto the A54 (Chester Road) and proceed until the junction. Turn left onto the continuation of the A54 and in 0.5 of a mile turn right onto Morreys Lane, where the property will be found in a short distance on the right hand side. Nestling in an enviable elevated rural South facing location on the western edge of Delamere Forest Park adjacent to the Sandstone Trail and Nettleford Wood this 0.43 acre stone and brick property looks over the green rolling hills and wooded ridge of the valley beyond. Encircled by mature specimen trees shrubs and hedging the property enjoys a high degree of privacy and is also a haven for wildlife with green woodpeckers pheasants and foxes routinely appearing in the garden. The house itself whilst requiring renovation and modernisation throughout is essentially a blank canvas for that buyer wishing to create their own unique bespoke home in an outstandingly beautiful location. Afforded greenbelt conservation area status new build residential development has historically been restricted and presently there are just a handful of other detached properties within the immediate vicinity preserving the kudos of the location and future proofing it&apos;s current level of privacy. Downdale House will undoubtedly appeal to the professional and executive commuter both couples and families alike aspiring to achieve an eclectic work life balance in an area that has an extraordinary abundance of amenities and is home to such venues as Cheshire Polo Club and Oulton Park Race Circuit. With a plethora of golf courses equestrian facilities health spas fine dining restaurants and hotels not to mention all the facilities Delamere Forest itself has to offer most pursuits are catered for locally. The main arterial A54 provides fast access to Chester City Centre whilst Manchester and Liverpool and their respective airports can be reached within a mere 50 minutes. Similarly the M56 M6 A55 and M53 are easily accessed within 25 minutes. Schools and colleges both state and private are also exceptionally well represented within the area. Exposed beams, windows to front and radiator. Open fireplace with brick surround and hearth, windows to side and rear, double doors to rear, exposed beams, wall light points and radiator. Tiled floor, fitted with a range of base units comprising cupboards, base units with work surfaces over and tiled splashback, inset one and a half bowl stainless steel sink unit with mixer tap and drainer, space for fridge and separate freezer, space for dishwasher, window to rear, inset downlighters, door to side and radiator. Tiled floor, low level WC, wall mounted wash basin with tiled splashback, shower unit with wall mounted shower head over and fully tiled wall splashback, window to front and inset downlighters. Tiled floor, stairs to First Floor, wall light points, understairs storage and radiator. Windows to front and sides, inset downlighters, built-in wardrobes and radiator. Windows to front and side, exposed beams, wall light points and radiator. 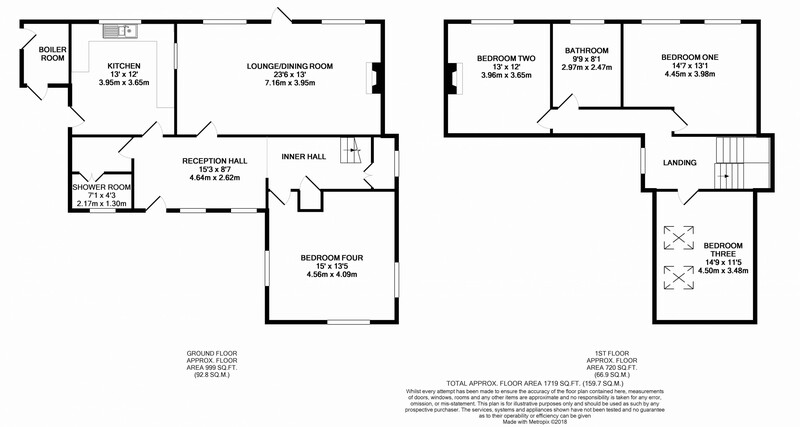 Exposed wooden flooring, exposed beams, inset downlighters, built-in wardrobes, windows to rear and radiator. Exposed wooden flooring, windows to front and rear, built-in wardrobes, feature period style fireplace, loft access and radiators. Exposed beams, Velux windows to side and radiator. Exposed wooden flooring, low level WC, pedestal wash basin with mosaic tiled splashback, panelled bath with mixer tap, separate shower head attachment over and fully tiled wall splashback, window to rear, exposed beam and radiator. The property is approached off Morreys Lane through a double gated entrance which opens onto an extensive gravelled driveway providing extensive off road parking for several vehicles.